- You’re now, inexplicably, back in the original world - only it seems quite different. Head to Castle Tycoon to the northeast, which, despite all the changes, seems pretty much the same as ever. - Walk southwest from Castle Tycoon until you see a bridge. Cross it, then head northwest. The mountains will gradually steer you to the Pirate’s Hideout. Here you’ll be rejoined by Boko the Chocobo - a new father! - who will allow you to move across the land much more quickly. - Head back to Castle Tycoon. Riding Boko you can cross the river north of the Castle. Head northeast along the shorelines - it’ll take a while - and you’ll reach Tule. Nothing new here. Head west of Tule and south to hit a cut scene that’ll drop everyone into a pit. A boss battle waits. Even with only two team members this is an easy battle. Aside from some physical attacks, the Antlion’s only real weapons is Dischord, which halves one character’s level. Meh. As long as you have one attacker and one support character - or, hell, even two attackers - you shouldn’t have any trouble winning. - You’ll be stuck in the cave for a bit after the battle, but eventually a rope will slip down. Eventually it will yank you back up, and Faris will join the party again. - Head south. There’s a cave down here. A cut scene follows, after which baaaad things happen. Many other things will happen, as well, and you’ll wind up at the Library of the Ancients, where you’ll get the Sealed Tome. - Leave the Library and head west through the mountains. You’ll find the Guardian Tree in a small copse of trees - check it for a brief cut scene - and beyond that, the Desert of Shifting Sands. The sands don’t shift so much anymore, though, so it’s easy for you to get at the pyramid in the middle of the area. - First thing’s first: get inside. When you approach the door a pair of Gargoyles will attack. These foes are basically normal enemies with extra HP, as well as an annoying twist: if you don’t kill them simultaneously, they’ll just keep coming back. Use Libra to scan their health constantly, keep them roughly level, then use an all-hitting attack to wipe them both out at once. This will open the Pyramid. - While wandering in the dungeon you may see some snakes wriggling about on the ground when you enter certain rooms. These are Aspis, and they’ll attack if touched. No big deal, though they do like to paralyze your units. - One more note: THIS DUNGEON IS AWFUL. So awful. - 1F. Head north along the western-most path and you’ll find a floor lined with poisonous spikes. You can wander right across if you want, but, yeah, poison. Depress the first and third blue buttons north of the spikes to create a safe path. You’ll get swept into the basement to the south. There’s a chest containing monsters to your left - try to wipe them out quickly, as they’re powerful but not at all durable - and an Ice Shield. Return to the first floor via the door in the north and you can head to the opposite side of the sand stream, deactivating it via a nearby button. - 2F. Wriggle your way through the walls to the left - there are invisible paths - and you’ll find a way to a sarcophagus on 1F. Approaching it will trigger a monster battle. This thing is undead, so fire and holy work really well. Once it’s dead you’ll find a Cursed Ring inside the sarcophagus. - Return to the entrance and go up the passage that’s closer to the entrance. On the second floor you’ll get locked in with some Aspis; hit the three buttons to open every nearby door. - 3F. There are three chests straight ahead, though approaching them will release more Aspis. The left contains a monster battle and a Flame Shield; the middle has the same battle, as well as Dark Matter; the right contains another damned battle (at least the enemy is different, though still undead) and a White Robe. In the east is a stairway that occasionally turns into a ramp; wait until it is just turning back from a ramp before running up, as slipping down will drop you into poison spikes. - 4F. This floor is patrolled by Mecha Heads, mechanical creatures with a lot of HP. They’re not that hard - electricity will fry them with a few powerful jolts, though their Wave Cannon can hurt pretty badly - but it’s not worth your time to kill the things if you can avoid it. There are a few chests in this area: the right-most contains an Elixir, the next sarcophagus over contains a monster battle and a Thornlet, the next contains an Elixir, the second sarcophagus has another battle and the path out of here, and the west-most chest - protected by spikes that you can retract via a nearby button - contain a monster battle, as well as a Black Robe. - 6F. You’re facing a room filled with sand streams. Deactivate them by hitting the blue buttons, though if you let the sand sweep you into the first two pits you’ll find monster treasure chests containing Dark Matter (upper pit) and a Black Garb (middle pit). On the right side of the room is a door; pop through and you’ll find a wall panel with two more button. If you hit the left button you can get at chests containing, from left to right, Dark Matter, Dark Matter, 9,000 gil, and 8,000 gil. The first two also contain monster battles. - 7F. There’s a dead end in the west; head to the end of it to find a secret passage with a chest containing a monster battle and a Gaia Hammer. To the north is a secret passage that leads to the central room. You’ll wind up near a chest containing an Elixir. You can also continue east down the secret passage, at the end of which is a chest containing 10,000 gil. Go up the stairs in the middle of the corridor. - 8F. The floor in here shifts, and if you’re caught over a pit you’ll fall down a level. 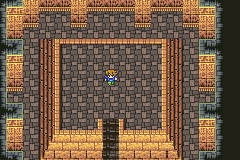 Run across to the central chest to find a Protect Ring, and carefully watch for unchanging floor tiles to reach the Ribbon on the left and the Gold Hairpin on the right. - 9F. There are two sets of stairs on 8F. If you go up the right stairs you’ll find a room with 10,000 gil and a monster box containing Dark Matter. Go up the left stairs to find an Elixir, another monster attack box containing Dark Matter, and, at the top of nearby stairs, an important-looking room with the first of the tablets you need to collect. Grabbing it will eject you from the dungeon. - Head back towards the Library of the Ancients. Make sure you heal and save before entering the forest with the Guardian Tree, ‘cause a battle’s coming up. No bones about it, you need magic for this one, or at least some access to the elements. Melusine has a rotating series of weaknesses, barrier changing periodically to a different weakness. Consequently, it can be difficult to fight her if you don’t have access to the elements. This is especially true since her normal defence is reeeeally high, and normal attacks won’t do a hell of a lot. She starts off weak to fire, so you can exploit that and begin with any form of fire attacks, preferably Firaga or Firaga Sword. Once she changes barriers she’ll become more vulnerable to physical attacks, so you may have to wait if you don’t have magic handy. Beat Melusine and you’ll get Lenna back on your team. Yays! Finally! Head to the coast in the east and you’ll find the airship waiting… though when you hop on, baaaaad things will happen. Once they’re done you’ll be free to explore the world as you please in the airship, and the final stages of Final Fantasy V will truly begin.